Chocolate Gourmand Blog » Blog Archive » Like chocolate turtles? Check out chocolate dipped pecan maple caramels. 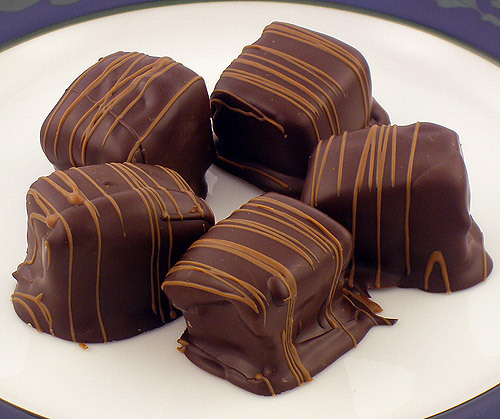 The first year I made candies I only made mocha truffles. The following year saw the addition of classic cream caramel and English toffee. Those three reigned for more than 5 years before I added gianduja truffles and chocolate caramels (I may make these chocolate caramels again, they were good, but my son hated the way they smelled when cooking). Last year saw the introduction of espresso caramels and a second failed batch of maple pecan caramels. This year I was again determined to add another candy to my repertoire. I spent some time looking for another type of candy to make. Although there is a lot you can do with truffles flavor-wise, I finally decided on a peanut caramel. It sounded like a home made pay-day candy bar, except I would be dipping mine in dark chocolate. When it came time to buy nuts for candies at Trader Joes, I suddenly realized I could substitute pecans for the peanuts. My wife has been bugging me to make caramel pecan turtles, which she loves. I made a dozen about five years ago, but the problem with turtles is that they are difficult to package with other candies since they are very fragile. This past year I have been brainstorming on how I might combine these three ingredients that go so well together. I originally envisioned just making the classic cream caramel recipe and wrapping a pecan half inside before dipping in dark chocolate. For this recipe, the pecans are coarsely chopped and you just stir them in rather than wrap them. What could be easier? This caramel is so easy to make, I would say it was the easiest candy for a person with no experience making candies to make (undipped truffles previously held that title). 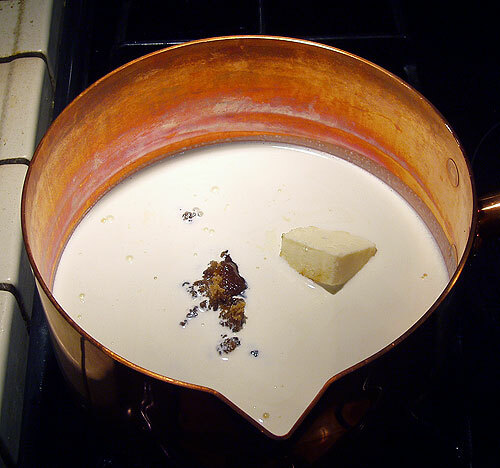 The cream does not need to be heated separately and the temperature only needs to be monitored once, so it was a very quick recipe to make. I wasn’t too sure about the temperature targets in the original recipe, it looked much higher than I like for most caramels. To be safe I lowered the target temperature a few degrees, but this still produced a caramel that was more firm than I like for dipping in chocolate, which I like to be just a little gooey. It was getting late and I debated just going to bed, but these caramels are so quick and easy to make I decided to go for another batch, this time adding some maple syrup. Since it was late and I wasn’t sure whether adding maple syrup would result in crystallization like the failed maple caramels from last two years, I decided to just shove a silpat mat in my one remaining baking dish rather than line with foil coated with safflower oil. I quickly cooked the caramel with the added maple syrup to a lower target temperature than the first batch and poured it into the silpat lined dish. Once covered in plastic wrap, I headed to bed. The next morning I removed the caramel from the silpat I was pretty thrilled to have the entire slab just peel right off with no effort. This was much easier than peeling bits of foil. Sometimes the foil peels off in tiny slivers and takes 15 minutes or more to remove. Combine the sugars, syrups and cream and boil until target temperature is reached. 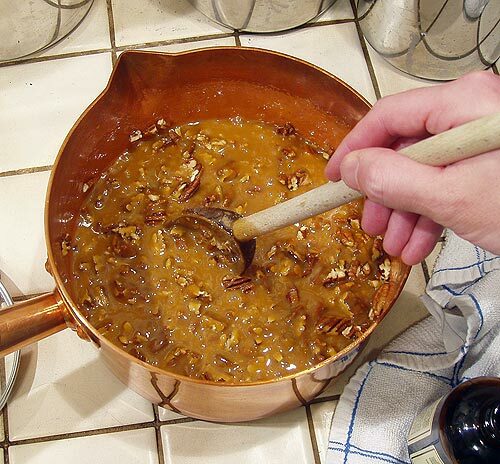 Stir in pecans and pour into prepared baking dish. Caramel cross section shows off the delicious pecan bits. 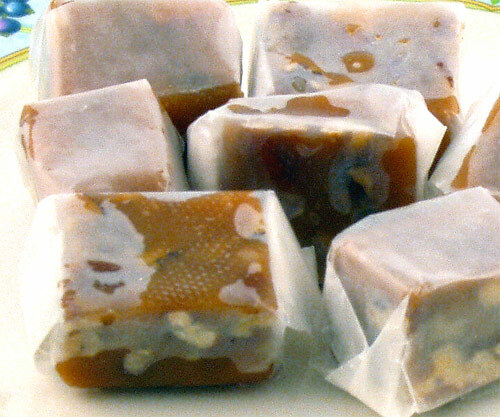 Caramels can be wrapped in wax paper if you prefer not to dip in chocolate. 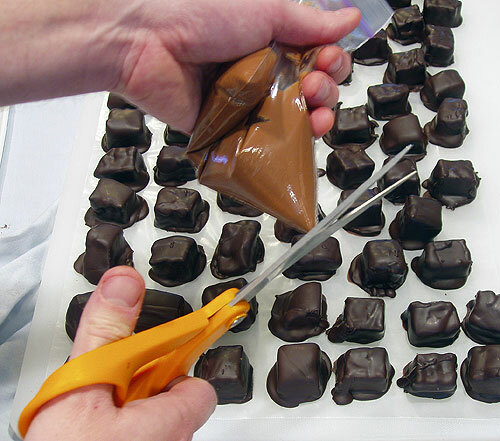 For decorating with tempered chocolate, simply snip the corner off a plastic bag and begin piping. Simple stripes of contrasting chocolate makes the candy look as good as it tastes. I dipped these delicious caramels in Valrhona 72% Araguani chocolate. My wife was thrilled with the neat, bite sized turtles and I had several candy recipients say that these caramels were their new favorite—the English toffee still holds a comfortable lead. The maple flavor in these caramels is subtle and I may experiment with exchanging corn syrup for maple syrup next year. 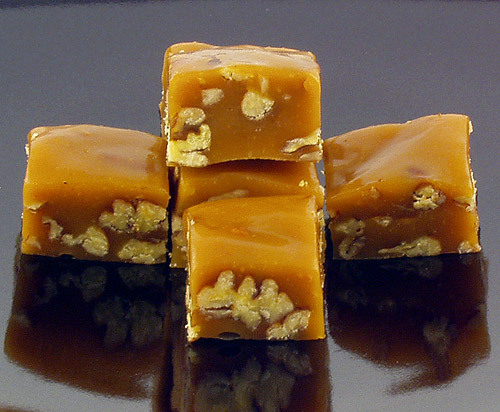 The recipe, with detailed instructions and complete photo gallery, can be found on the Pecan Maple Caramel recipe page. This entry was posted on Saturday, January 6th, 2007 at 11:27 pm	and is filed under Candymaking. You can follow any responses to this entry through the RSS 2.0 feed. You can leave a response, or trackback from your own site. Wow, these look fantastic. They wouldn’t last a week at my house! Thanks for introducing me to your site. Stop by anytime. those look soo great. I’m surprised you note that carmel is easy to make. I have always had a hard time because it is so sticky! They were great, I was lucky enough to receive some from Brian. I’ve had nightmare candymaking sessions with caramels, and finally, somehow managed to get out a batch or two. I found that putting them in the fridge caused the wax paper to stick, and that the cheaper or thinner the wax paper, the worse it was. I did discover a great new popcorn ball and caramel corn by my mistakes, and now never try to make caramel without a bowl of popcorn on stand-by. Hi Jeanna, I’m surprised at the number of people that have been giving me a hard time for saying caramels are relatively easy. Are you making super gooey caramels? I know they tend to stick a bit more. I typically reserve the softest batches for dipping (which is challenge with really soft caramels). Are you using the wax paper to line the pan or for wrapping? I just used silpat with caramels for the first time last month and was thrilled. I simply wedged the big silpat sheet into my 9×13 baking dish and poured the caramel in that. I then wrapped the bulky assemblage (the silpat sticks up) with several layers of saran wrap and let it sit out overnight on the counter. No sticking at all. I used to oil aluminum foil before, and some batches requird 15 minutes of delicate peeling–what a sticky mess! There are easy Turtle recipes at AnOccasionalChocolate.com even a Turtle mold. Looks like simple fun. check it out. That’s amazing! I am drooling, and I have been trying to cut back on candy. Thanks Foodaholic, caramels are indeed pretty rich, and are actually pretty easy to make, so you have got to show some restraint! Yum! This looks good! Yum! I’m sort of a novice to working with chocolate and I was hoping that I could get some help or opinions on what I’m trying to do. I’ve been trying to create a really good gourmet apple- Granny Smith dipped in Caramel, then chocolate. But I’m having a hard time with the chocolate being contaminated after I dip the first apple that is coated in caramel. It starts to crystallize and doesnt really look good. It becomes even more of a problem if I have more than one apple to do. I’ve tried a couple different caramels, one was so hard, I couldnt even cut the apple. (Which, if I understand correctly was a temperature problem) The latest one I think is too liquid as it breaks through the chocolate in little oozes and I think greatly contributes to the contamination problem. Should I be searching for yet another caramel that is not so liquidy? Would this negate the contamination problem? Any advice from those more experienced would be appreciated.